A paper published in Astronomy & Astrophysics reconstructs solar activity over the Holocene and finds solar activity at the end of the 20th century was near the highest levels of the entire 11,500 year record. 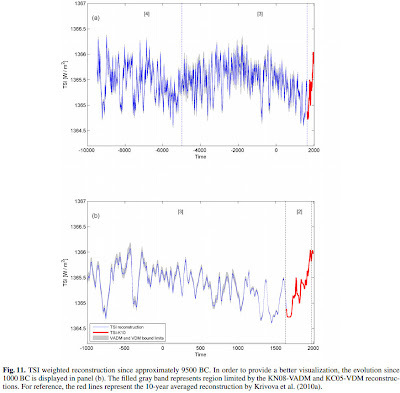 Over the past 2,500 years, the paper shows a 'hockey stick' of solar activity, with a sharp increase following the end of the Little Ice Age in the 1800's. Context. Long-term records of solar radiative output are vital for understanding solar variability and past climate change. Measurements of solar irradiance are available for only the last three decades, which calls for reconstructions of this quantity over longer time scales using suitable models. Aims. We present a physically consistent reconstruction of the total solar irradiance for the Holocene. Methods. We extend the SATIRE (Spectral And Total Irradiance REconstruction) models to estimate the evolution of the total (and partly spectral) solar irradiance over the Holocene. The basic assumption is that the variations of the solar irradiance are due to the evolution of the dark and bright magnetic features on the solar surface. The evolution of the decadally averaged magnetic flux is computed from decadal values of cosmogenic isotope concentrations recorded in natural archives employing a series of physics-based models connecting the processes from the modulation of the cosmic ray flux in the heliosphere to their record in natural archives. We then compute the total solar irradiance (TSI) as a linear combination of the jth and jth + 1 decadal values of the open magnetic flux. In order to evaluate the uncertainties due to the evolution of the Earth’s magnetic dipole moment, we employ four reconstructions of the open flux which are based on conceptually different paleomagnetic models. Results. Reconstructions of the TSI over the Holocene, each valid for a different paleomagnetic time series, are presented. 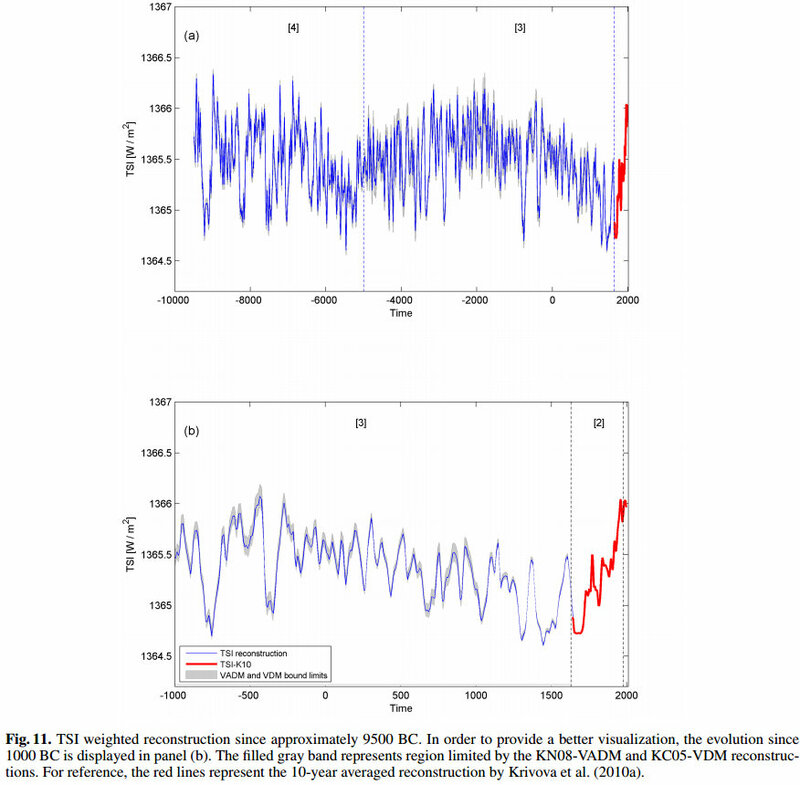 Our analysis suggests that major sources of uncertainty in the TSI in this model are the heritage of the uncertainty of the TSI since 1610 reconstructed from sunspot data and the uncertainty of the evolution of the Earth’s magnetic dipole moment. The analysis of the distribution functions of the reconstructed irradiance for the last 3000 years, which is the period that the reconstructions overlap, indicates that the estimates based on the virtual axial dipole moment are significantly lower at earlier times than the reconstructions based on the virtual dipole moment. We also present a combined reconstruction, which represents our best estimate of total solar irradiance for any given time during the Holocene. Conclusions. We present the first physics-based reconstruction of the total solar irradiance over the Holocene, which will be of interest for studies of climate change over the last 11 500 years. The reconstruction indicates that the decadally averaged total solar irradiance ranges over approximately 1.5 W/m2 from grand maxima to grand minima. So the first chart shows an 8,000 year solar cycle with decreasing solar activity between -10,000 to -6,000, increasing between -6,000 and -2,000, decreasing between -2,000 and 2,000, followed by the recent increase.